Campaigners fighting against Aberdeen FC’s plans for the new £50million Kingsford Stadium have officially lodged a petition for judicial review. The No Kingsford Stadium group, which raised more than £66,000 for the legal challenge, put forward the petition late on Friday afternoon. The official deadline for lodging a petition for judicial review was Sunday. 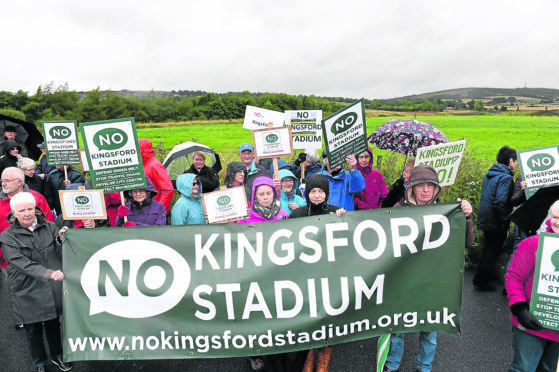 The NKS organisation has highlighted a number of reasons it is opposed to the plans for the stadium’s location through high-profile campaigning, including concerns over infrastructural, environmental and amenity impact in the Westhill and Kingswells areas. A spokesman for the city council said: “We note proceedings have been raised in relation to the planning consent granted for the Kingsford development.